Odia boy Devesh Ranjan had dreamt of getting into the tinsel town even when he was in college, a decade ago. Once he got into the Himachal Culture Research Forum and Theatre Academy and had the opportunity to work with eminent theatre personalities like B V Karanth, Robin Das, Surendra Sharma and Aloke Chatterji, acting had turned into a passion for this aspiring actor. To get a foothold in the entertainment industry, Ranjan moved to Mumbai and approached filmmakers but he had to settle with small roles in serials, some modelling assignments and even casting for films. It was the experience he had during these days that sowed the seeds for “Vara: The Blessing”, an international project which marked his debut as an actor, directed by Bhutanese director Khyentse Norbu of ‘The Cup’ fame. Here is what Ranjan shares about “Vara…”. Vara is in English and based on a short story by Sunil Gangopadhyay. 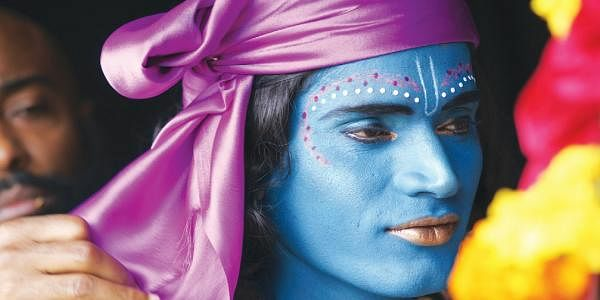 I am playing the role of Shyam, a low caste village boy who belongs to the clan of clay artists. The movie revolves around a young woman named Lila, her mother Vinita, a temple dancer and Shyam. The film is about their life, losing their innocence through the harsh realities of life with a parallel world evoking Lila’s love for Shyam whom she considers equal to Lord Krishna. Prior to ‘Vara’, I had got small roles in two Hindi films. Not very keen on doing those, I returned to my home town Keonjhar for a break when I got a call from my guru and teacher from Himachal Theatre Academy, Dilip Shankar. He broke the news that Norbu, the director, wanted to audition me immediately. Once I got the script, I asked a friend to shoot me doing some of the scenes in Keonjhar and sent the tape to Norbu. He liked it and called me for the second round of audition to New Delhi. I cannot forget the day when Uma and Vara producer Nanette Nelms informed me that I was selected for the role. I still feel it was a blessing after years of hard work. Norbu is an actor’s director. He knows how to bring out the best in an actor. He guided me in my role as a harassed, poor Dalit boy. He would tell me to tone down whenever I became melodramatic in my scenes. Sahana is a gorgeous person and it was amazing watching her perform on the sets. Her portrayal of the gamut of emotions of the character was a treat to watch. I am confident that this film will bring me many more good roles in future. It’s a good time to be an actor, with roles being written that allow you more scope to reinvent yourself. There’s also a lot of international work of different ethnicities coming to Indian actors, which give you a worldwide audience.